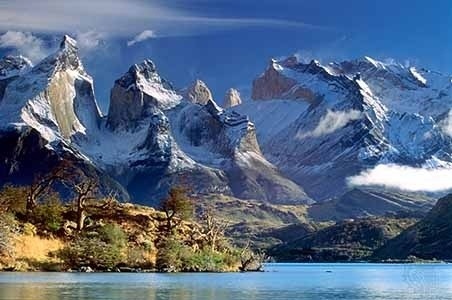 The above image is Torres del Paine National Park, Chile, Tierra del Fuego. It is a misty focus of my possible next adventure. The genie is out of the bottle. This torment. I know the beast well–thought I’d tamed it into a corner. Return from an adventure and start thinking about the next one. That is the torment. Specifically, there is nothing of substance in the works, just the cranky wheels turning between my ears. I was in Tierra del Fuego maybe ten years ago. I was chasing trout, measured there not in inches but in pounds. It’s the end of the earth, the last stop before slipping on the ice of Antarctica. It was Magellan who named the island, Land of Fire. From his ship he observed the fires of the Yaghan indians. It is estimated that the Yaghan ancestors settled the island around 8000 b.c. There remains today but one full-blooded Yaghan, Cristina Calderón, born in 1928. The Yaghans survived on sea-lions which the men hunted. The women dove from canoes into the frigid ice-strewn waters to forage the sea bed. In this manner these people existed for thousands of years. But they could not survive being “discovered” by the Europeans. Captain FitzRoy of the HMS Beagle captured three Yaghans on that vessel’s maiden voyage. He decided to return them to England, where they were to be taught “English..the plainer truths of Christianity..and the use of common tools.” They were to be trained as missionaries and would be returned to save the souls of their brothers and sisters. It was the second voyage of the Beagle, including onboard a young scientist, Charles Darwin, that delivered them home. A year later, the Beagle returned once again and found only one of the Yaghan-missionaries remaining. He “had not the least wish to return to England.” No report on souls saved or lost remains. How can one resist the pull of such a place? Legend claims that if a person eats the Calefate berry they will return to Tierra del Fuego. And, yes, I ate the berry. It is just a matter of time.